Squirrels in Minnesota – There are three common squirrel species in the Minneapolis, MN area. You’ve got your red squirrels, grey squirrels and then flying squirrels. While the red and grey squirrels are up and scavenging during the day, flying squirrels are nocturnal and only start to move around at night. No matter what time of day it is, squirrels are experts at finding little spaces or pathways into your home so that they can take a rest from the cold or build a nest for their litter in the spring. Squirrels will nest in your attic, get in between your wall space, or even make their way down your chimney. They can be incredibly hard to reach all while chewing on your wires, pipes, ducts, vents, woodwork, walls, etc. You name it, they will chew it. 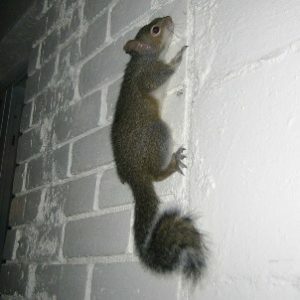 This leads to squirrel feces in hard to reach spots and the potential for some major structural and electrical damage. If you notice a squirrel in your home or you can just hear them running around, the quicker you get them out, the better! When you call our experts at Minnesota Wild Animal Management, Inc., we will come out to your home and assess the issue. We will talk you thru our removal process and give you an honest, affordable quote with no hidden fees. We will then begin the process of squirrel control which involves trapping them and then removing them, which is all done in a very timely and humane manner. After the squirrels are removed, we will then begin the process of fixing the damage they may have caused and implement preventative measures so that they do not return. If you are looking for squirrel control in the Minneapolis, MN area, contact your experts at Minnesota Wild Animal Management, Inc., today. Call us day or night at (651) 260-7378.